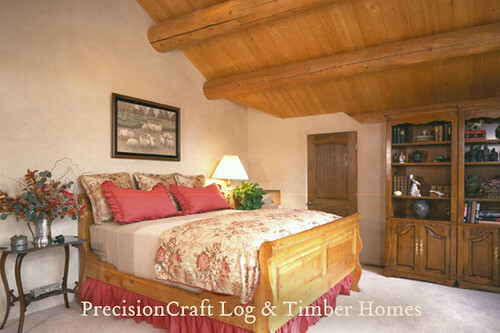 Post & Beam Handcrafted Log Home Bedroom | Home located in Sun Valley, Idaho | by PrecisionCraft Log Homes & Timber Homes, upload feito originalmente por PrecisionCraft Log Homes. In this post and beam log home combining plaster infill walls and log is a great way to maintain the feel of a log home and provides a flat surface to show case artwork. For other log home ideas on how to combine traditional building materials and log, visit PrecisionCraft Log & Timber Homes.